While researching the Arctic for a school project, Robin learns that something is melting the glaciers - and it's not just global warming! With Batman's help, Robin discovers that eco-terrorist Ra's Al Ghul is behind the polar heat wave. 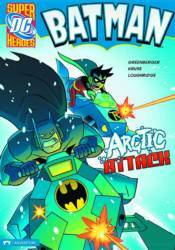 To prevent an environmental disaster, the Dynamic Duo must brave the icy tundra and stop his evil plan.